Five Central Oregon nonprofits have been selected to take part in the May 8 Pitch for a Purpose, presented by Ideal You Weight Loss Center and Jules Accounting. All five local charities will make a pitch presentation before the judges and live audience. One organization will walk away from the event with $12,000 in unrestricted funds and another will earn an audience choice cash prize. The five nonprofits were selected from a pool of nine that participated in Leadership Bend’s Impact Summit, a series of hands-on workshops designed to provide education and training to small to midsize nonprofits in Central Oregon. Calling all non-profits! The application deadline for LBIS 2019 has been extended until 11:59 p.m. TODAY, Friday, January 11th! Please submit your application by the new deadline for a chance to become one of five finalists vying for a $10,000 cash prize. BEND, Oregon (April 11, 2018) – Five Central Oregon nonprofits have been selected to compete for nearly $15,000 in cash awards at Pitch for a Purpose, presented by Alex Hodge Construction, on May 1 at Central Oregon Community College’s Wille Hall in Bend. The Education Foundation for Bend-La Pine Schools, Friends of the Children, The Giving Plate, the Humane Society of the Ochocos, and In Our Backyard all will have a chance to win $12,000 based on business pitches they deliver to a panel of judges during the fourth annual Pitch for a Purpose, the culminating event of the 2018 Leadership Bend Impact Summit. The public is encouraged to come out and support these five nonprofits as they deliver their pitches. Sarah Pool, the founder of Pacific Superfood Snacks and current CEO of Canvas prebiotic shakes, will present the keynote address. Tickets, which can be purchased at lbimpactsummit.com, are $15 and include drinks and hors d’oeuvres. Attendees will also have a chance to vote on a $2,500 Audience Award prize. The five Pitch for a Purpose finalists emerged from a group of 10 organizations that participated in a series of business workshops that made up the first round of the 2018 Leadership Bend Impact Summit. Since its inception in 2015 the Leadership Bend Impact Summit has awarded nearly $40,000 in cash prizes to Central Oregon nonprofits. Previous Pitch for a Purpose winners include Healthy Beginnings (2017), La Pine Community Kitchen (2016) and Healing Reigns Therapeutic Riding Center (2015). The Education Foundation for the Bend-La Pine Schools prepares our students for success and the future through exceptional educational and extracurricular opportunities. Friends of the Children is a nationwide organization that breaks the cycle of generational poverty. Feeding the hungry today with compassion and hospitality. Our Mission is to help create a community responsible for animals, to give shelter to stray and abandoned domestic animals, and find them loving, permanent homes. We envision a day when human trafficking no longer exists in our backyard and all people are empowered to live in freedom. Leadership Bend is a community development program designed to identify, educate, train and connect willing and committed citizens to leadership roles in Bend. Now in its 25th year, Leadership Bend is a separate 501 (c) (3) non-profit organization, a program of the Bend Chamber and fully supported from community resources. For more information on Leadership Bend, please visit bendchamber.org/about/leadership-bend. Ten Central Oregon nonprofits representing a broad cross section of human services, education and the arts have been chosen to participate in the 2018 Leadership Bend Impact Summit. Additionally, five organizations that successfully complete the workshop series will then be selected to participate in Pitch for a Purpose, the culminating event of the 2018 Leadership Bend Impact Summit. At Pitch for a Purpose, nonprofits will have a chance to win $12,000 based on business pitches they deliver to a panel of judges. This year’s Pitch for a Purpose will be held May 1 at Central Oregon Community College’s Wille Hall. Tickets are $15 for the public and include drinks and hors d’oeuvres. Attendees will also have a chance to vote on a $2,500 Audience Award prize. Previous Pitch for a Purpose winners include Healthy Beginnings (2017), La Pine Community Kitchen (2016) and Healing Reigns Therapeutic Riding Center (2015). BEND, Oregon (Nov. 29, 2017) – Leadership Bend will host its fourth annual Pitch for a Purpose contest on May 1, 2018, at Central Oregon Community College’s Wille Hall, located in the Coats Campus Center in Bend. The culminating event of the Leadership Bend Impact Summit (LBIS), a multi-day series of workshops for Central Oregon nonprofits, Pitch for a Purpose gives those organizations that successfully completed LBIS workshops a chance to win $12,000, based on business plan pitches they deliver to a group of local business leaders. Previous Pitch for a Purpose winners include Healing Reigns Therapeutic Riding Center (2015), La Pine Community Kitchen (2016) and Healthy Beginnings (2017). Prize money from past Pitch for a Purpose events has aided doctors in detecting developmental problems in toddlers, helped veterans with PTSD reintegrate into society, and made it easier for children from low-income families to receive consistent meals. Small plates and drinks will be served at Pitch for a Purpose and the public is encouraged attend. One competing nonprofit will also win an Audience Choice Award of $2,500. For more information on the Leadership Bend Impact Summit and Pitch for a Purpose, including how to apply for LBIS or become a sponsor, go to lbimpactsummit.com and follow us on Facebook. Leadership Bend is a community leadership development program designed to identify, educate, train and connect willing and committed citizens to leadership roles in Bend. Now in our 25th year, we are a separate 501 (c) (3) non-profit organization, a program of the Bend Chamber, and fully supported from community resources. There are over 400 Leadership Bend alumni who have gone on to serve as our “community trustees.” For more information on Leadership Bend, please visit bendchamber.org/about/leadership-bend. 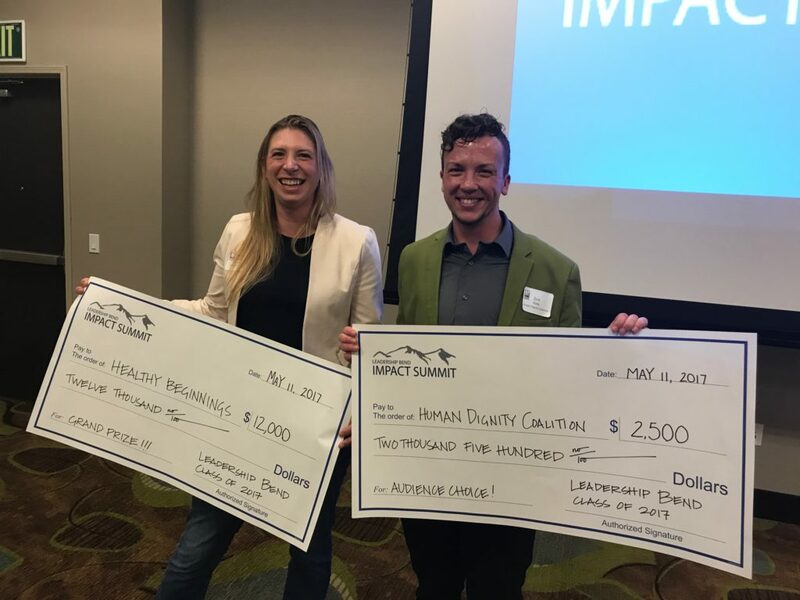 Healthy Beginnings was chosen as the 2017 winner of the Leadership Bend Impact Summit, earning this local non-profit organization a Grand Prize of $12,000 for the best “pitch” before an esteemed panel of judges. The “Audience Choice” winner was the Human Dignity Coalition, earning that organization $2,500. At the Leadership Bend Impact Summit, each organization had six minutes to speak, and another six minutes to field questions from a panel of judges that included Dennis Lynn, Senior Instructor of Human Development and Family Sciences at OSU-Cascades; Connie Druliner, President and CEO of Express Employment Professionals; Adrienne Graham, Central Oregon Regional Director for the Non-Profit Association of Oregon (NAO), Chuck Horne, General Manager for La Pine Community Kitchen; Jim Lee, InvitExcellence and Director Emeritus for Abilitree. The winning pitches were delivered by Kelli Neumann, Regional Outreach Coordinator for Healthy Beginnings, and Aaron Rook, Secretary for the Human Dignity Coalition. The Leadership Bend Class of 2016 is pleased to announce La Pine Community Kitchen was awarded the $10,000 grand prize at the second annual Central Oregon Impact Summit (COIS). During the “Pitch for a Purpose” event, held at the Riverhouse on the Deschutes Convention Center, five finalists – Deschutes Children’s Foundation, Healthy Beginnings, High Desert Food and Farm, La Pine Community Kitchen and Treehouse Therapies – took the stage to show off the culmination of how the COIS series of four workshops equipped them to better position themselves in our community. La Pine Community Kitchen, which won the audience-choice award at the 2015 COIS event, helps meet the needs of those experiencing hunger and lack of resources in our community by providing free nutritious hot meals, emergency food boxes, fresh produce and clothing. In addition to the $10,000 prize a $2,500 audience-choice award was awarded to Treehouse Therapies. Ken Streater, social entrepreneur, acclaimed author and successful real estate brokerage partner, inspired the crowd of more than 200 during his keynote address. COIS received a great deal of support from many members of the Central Oregon community. Nonprofits participating in COIS received coaching from Grow Oregon Business Advisor Pam Stevenson; Robert Rekward, co-owner and founder of Delicious Design; George Myers, principal of GMARS Consulting; and Lori Slaughter, philanthropy advisor at EIG & Principal. Learn more about the Central Oregon Impact Summit and how to get involved next year at: www.lbimpactsummit.com. Leadership Bend is a nine-month program of the Bend Chamber. The purpose of the COIS is to empower Central Oregon’s nonprofits to strengthen our communities in the region. Learn more about Leadership Bend or apply to be a part of the Leadership Bend Class of 2017 at: http://bendchamber.org/leadership-bend/. The Leadership Bend Class of 2016 is pleased to announce the five nonprofit organizations selected to compete for a $10,000 prize on May 10th at the second annual Central Oregon Impact Summit (COIS) “Pitch for a Purpose”. During the “Pitch for a Purpose” event, held at the Riverhouse on the Deschutes Convention Center, five finalists will take the stage and show off the culmination of how the COIS series of four workshops equipped them to better position themselves in our community. Get to know, strengthen and empower the nonprofits in our local communities. To register to attend the “Pitch for a Purpose” event and vote for the audience choice award, please visit: this website. Learn more about the Central Oregon Impact Summit here. Leadership Bend Class of 2016, a program of the Bend Chamber, is pleased to announce the nonprofit organizations accepted to participate in the second annual Central Oregon Impact Summit. Sunriver STARS Community Theater (SSCT) was the brainchild and passion of founder Victoria Kristy-Zalewski in 2011, who moved to Sunriver from Tacoma where she was a teacher/actress for many years. Her vision was to see a community based musical and dramatic arts theater started in Sunriver. Junior Achievement (JA) motivates students to own their economic success through hands-on programs that promote skills and knowledge in three critical areas: work readiness, entrepreneurship and financial literacy. Two main program types are offered: JA In-Class Programs and JA Finance Park. The mission of High Desert Food & Farm Alliance is to support a community-based food system in Central Oregon by increasing access to fresh healthy food, supporting sustainable farmland use and fostering relationships among farmers and consumers. In 1990, community leaders determined a need in Deschutes County for a centralized location for children and families to receive basic services. Deschutes Children’s Foundation (DCF) at the Rosie Bareis Community Campus is the result. Twenty-five years later, Deschutes Children’s Foundation has expanded to encompass four community campuses in Bend, Redmond and La Pine. DCF provides the critical infrastructure where 26 nonprofit partners serve over 20,000 children and families each year. The Latino Community Association is training a skilled, bilingual workforce to meet the needs of our Central Oregon economy through English and computer instruction, resume help, job connections and career coaching. The mission at Dawns House is to create a hands-on, nurturing, structured environment for women directly out of treatment, prison or by referral. Dawns House empowers and leads the women by helping them to help themselves. The nonprofit guides each woman to successfully re-enter society and thrive in mainstream living, providing the tools and resources preparing each woman to face a new dawn on her journey. La Pine Community Kitchen helps meet the needs of those experiencing hunger and lack of resources in our community by providing free nutritious hot meals, emergency food boxes, fresh produce and clothing. The Waldorf School of Bend (WSB) serves families with children from early childhood through ninth grade. An education at WSB follows established Waldorf curriculum, rich in the arts and humanities. Our community culture is rich in character, diverse religions and social beliefs, and economic backgrounds. Our shared values include social responsibility and self-awareness, kindness and compassion for humankind, and a strong reverence for the health of our environment. These values lay the foundation for our children to grow and learn. We work to create an inclusive community that fosters the virtue of each individual, so that each may find his or her way to contribute to the community as a whole. Support from our parents, alumni, friends and greater community is vital to the health and success of our school. A profound understanding of child development is the cornerstone of teaching and learning at the Waldorf School of Bend. Our curriculum is interdisciplinary, relevant and timely to ensure that our students are equipped to fully participate in the possibilities and challenges of our ever-changing world. We uphold excellence in education by creating meaningful teacher-student relationships, and joyful, artistic teaching that supports learning through inspiration, imagination and intuition. On May 10th, five of these nonprofits will take the stage and show off the culmination of how they have become well-equipped to better position themselves as organizations during a Pitch Night at The Riverhouse Convention Center. Congratulations to these fine organizations! Calling all non-profits! The application deadline for LBIS 2017 has been extended until 5:00 p.m. on Friday, February 24th! Please submit your application by the new deadline for a chance to become one of 5 finalists vying for a $10,000 cash prize. Leadership Bend is looking for sponsors to help support the Leadership Bend Impact Summit. Contact us today! LBIS is hosting a series of workshops for nonprofits in the areas of business planning, finance, impact measurement, marketing and pitch coaching. Apply by Jan. 4th 2019! Nearly $20,000 in award money will be up for grabs at the LBIS “Pitch for a Purpose” event! Support the Leadership Bend Impact Summit by making a donation.